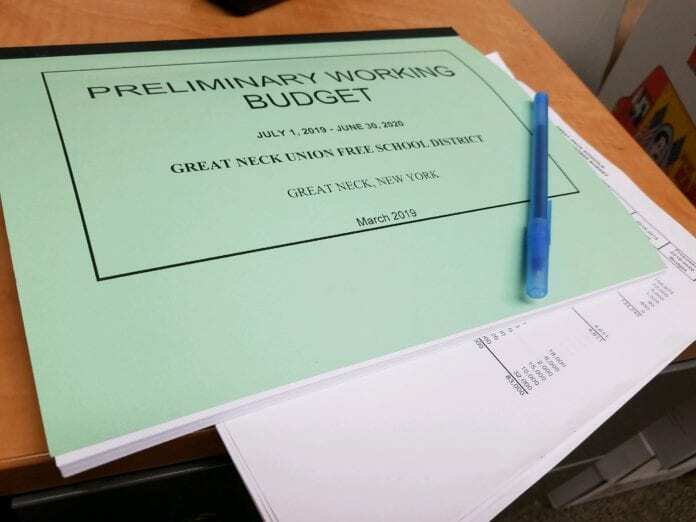 The Great Neck Public Schools’ proposed $233.64 million budget is likely to change, school officials said at a budget review session Saturday morning, in response to staffing concerns and increasing numbers of higher need students. At the same time, Berkowitz said the board honors its “responsibility to be fiscally responsible” and think about taxpayers, who are now seeing their properties reassessed and perhaps feeling the pinch of their state and local tax deductions being capped at $10,000. Berkowitz also said the budget could still change. The currently proposed tax levy increase is 1.94 percent, less than half the allowed 4.09 percent, due to a high growth factor and borrowing for capital projects related to the $68.3 million bond approved in 2017, John Powell, the assistant superintendent for business, previously said. This translates to an expected property tax levy revenue increase from $203.57 million to almost $207.52 million. Stephen Lando, the assistant superintendent for secondary education, said there has been an increased demand for business and math courses between the two high schools. Many students also do not take their lunch period, he said, opting to use it for programs instead. Additionally, Lando said Great Neck has seen “significant” growth on the secondary level, with families moving into the area with older children rather than elementary-aged students. While each cohort of student varies, Lando said there has been an increased demand on the ENL population and services. Trustee Donna Peirez also asked about an apparent increase in demand for ENL help, to which Lando said it is going to be the topic of an upcoming meeting with the secondary school principals. Joseph Hickey, the assistant superintendent of special education and pupil services, said families with students with IEPs, or individualized education programs based on special needs, have come to the Great Neck schools at a greater rate in recent years because of the litany of services the district provides. The number of these students in the 2016-17 school year was 989. In the 2018-19 school year, that number has increased by 109 students to 1,098, Hickey said. “We’ve got a lot of people that move in with an IEP,” Hickey said. Hickey said the increase in students was a primary driver of the proposed increase for special education services in the budget. It calls for boosting special education funding to $33.34 million from the current level of nearly $31.15 million– a difference of $2.19 million, or 7 percent. Hickey also said the district has increased classes, expanded psychological services, and assigned full-time social worker to their high schools. Jim Daszenski, the president of the Great Neck Teachers Association, commended the school board for keeping class sizes low, preserving programs and adding staff, but said those particular numbers don’t tell the entire story. The rise in high-need ENL students puts more pressure and responsibilities on teachers, for example, and the salaries for school nurses are inadequate to attract them, Daszenski said. While Daszenski was not calling for the board to adopt a 4.09 percent increase in the tax levy for this budget, he said the district should consider upping the levy to address these issues. Just as the previous budget responded last year to security concerns after a mass shooting at Marjory Stoneman Douglas High School in Florida, Prendergast said this budget could undergo another thorough review and change in response to the current concerns as well. “And quite honestly, based on some of the things you’ve heard from the administration today, in all likelihood we will be doing that again in the weeks to follow,” Prendergast said. how in their right mind can this administration justify a parking lot for the rich kids to show off when there are other needs??? Wake up voters: this board and administration wants to waste our tax money. The change to start secondary education should be earlier. So a five year old can go to sixth grade. And a six year old can go to seventh grade. And a seven year old can go to eighth grade. And an eight year old can go to ninth grade. And a nine year old can go to tenth grade. And a ten year old can go to eleventh grade. And an eleven year old can go to twelfth grade. I promise you there would be no immigrant students want to take advantage of American school system if the kids here are too advanced. And then our elementary schools can serve like day care centers. People are always complaining about high costs of day care. It would be free under the public school system.